Where Is Kaman Going To Land After Clipper-Land? Recently, the LA Clippers acquired Zach Randolph from the Knicks for some left-over popcorn and a couple of dirty jerseys (no disrespect to Tim Thomas and Cat Mobley, but this “trade” was more of a giveaway). Now, the Clippers have the challenge of splitting minutes between 3 solid big men (Randolph, Kaman, and Camby). While it might sound great to have three potential all-star bigs, it’s a luxury the Clips can’t afford. The truth is the Clippers are weak at the 2 and 3, and moving one of their bigs (either Camby or Kaman) is the best way to balance the starting roster. So who will it be – which big will the Clippers trade for a swingman? The consensus choice is to move Kaman. Kaman and Randolph don’t really complement each other (at least on paper), whereas Camby and Randolph seem like they can balance each other fairly well. So where will Kaman go? Charlotte seems like a perfect match. Gerald Wallace is a top-notch SF, Kaman is a top-notch PF/C. Neither is a superstar, but both could be in the right situation. This move likely makes both teams a little better. Still, you have to wonder why this deal hasn’t happened already. Perhaps Charlotte isn’t quite ready to part with Gerald Wallace…or perhaps there are some pieces involved that can’t be traded until the 15th of December. Chicago is intriguing. The Bulls need a scoring big (Tyrus Thomas is still very raw and Noah isn’t capable of becoming a scoring threat), and they have exactly what the Clippers need in Andres Nocioni and Ben Gordon. Gordon has made no secret of his desire to leave Chicago, and Nocioni is a luxury Chicago likely can’t afford (not with Deng’s humongous contract). Still, the chances of this deal being made during the season are slim. Gordon loses his Bird rights if he’s traded, and considering just how much he thinks he’s worth, that’s not going to happen (Gordon can veto an in-season trade). If this deal did go down next year, both teams would be much better. What about the Wizards? The Wizards look like a team blowing apart. Losses are stacking up, Gilbert Arenas is talking about the positives of ending up in the lottery, and the Eastern Conference isn’t getting any softer. The Wizards haven’t been very competitive playing three perimeter all-stars in the playoffs, so maybe they should shake things up and swap Caron Butler for Kaman. Losing “tough juice” would be hard for the fans in Washington, but playing an inside-out game with Agent Zero and Kaman (with Tawn’ around to knock down open jumpers and create mismatches) would be much more traditional. It would be a bold move for the Wizards (Butler might just be the glue that holds the team together), but what they’ve been doing isn’t working. LA ends up with the best prize in this deal – a tough defender and able scorer that knows how to work with an egomaniac. Of course, the Clippers could move Camby. His deal wouldn’t bring them as much in the way of superstar talent, but he would definitely help fill-in some of the team’s gaps. Perhaps the critics (me included) will see that Kaman and Randolph can play together. Perhaps that’s what the Clippers are hoping for too. No matter what happens, Chris Kaman or Marcus Camby are leaving Clipperland within the next year – likely before the trade deadline. Sam Cassell Want’s Money To Quit His Job. 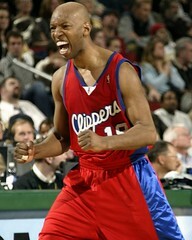 I like Sam Cassell – I like Sam Cassell a lot. He’s a good leader, a good scorer, and he can run an offense. He’s an ambassador of the game, and the fact that he’s capable of helping any number of teams win a championship at age 38 is nothing short of amazing. He’s one of my heroes.